Of all the restaurants we visited in Paris, Breizh Cafe has the unique distinction of being the only one that was recommended by all three sources I consulted. So even though we had no other reason to be in the Marais neighborhood in the 3rd Arrondissement, we made a special trip there in search of these famous crepes. This little cafe is a pretty hopping place. Luckily, we only had a short wait for a table, and right by the open glass doors too! It was like scoring patio seats! We both ordered something off the daily specials menu. 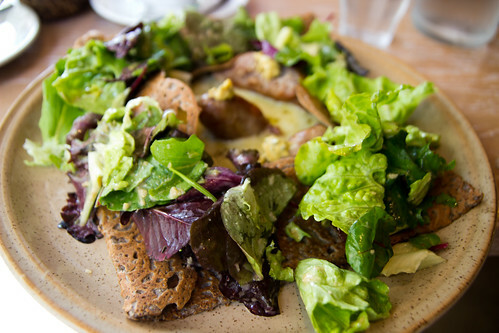 I chose the Rustique Galette, a buckwheat crepe with Brittany sausage, mustard, seaweed, cheese, and salad. It was truly delightful, and what a great combination of flavors. 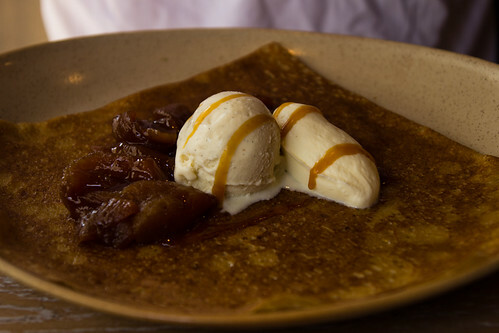 R. got a sweet crepe: the Dame Tatin, with caramelized apples, vanilla ice cream, and salted butter caramel. All-round delicious! Conclusion? Yes, these crepes were worth the hike to Breizh Cafe. Now I can personally attest to why everyone loves this place so much!